Our friends at The Creeping Bent Organisation announce a Vic Godard ‘weekender’ in Glasgow on the 1st and 2nd December. A weekend of events celebrating the music of Vic and his influential punk band, Subway Sect. VIC.ism kicks off with a gig at Stereo on Saturday 1st December in which Vic and the Sexual Objects will perform Subway Sect songs. Then on Sunday 2nd at new Glasgow music and art space The Poetry Club the We Can Still Picnic collective present an Afternoon Tea with Vic Godard – Vic will be engaging in spoken performance, readings and jazz whilst the We Can Still Picnic guys serve tea, scones and sandwiches. Following that on Sunday evening the Monorail Film Club present a screening of Pierrot le Fou at the GFT – selected and introduced by Vic. Following the screening Stephen Pastel hosts a Q&A with Vic in which they’ll discuss, amongst other things we’re sure, the influence of Jean-Luc Godard and European Cinema on the early Subway Sect material and style. The live performances will also feature a Sound of Young Scotland mobile exhibition of photographs taken by Harry Papadopolous. These projections will feature photos of Vic along with the Scottish groups (Orange Juice, Josef K, Fire Engines, etc) that were inspired by seeing Subway Sect on the White Riot tour thirty five years ago. Here’s Racket Racket collaborator Douglas MacIntyre’s thoughts on Vic and Subway Sect’s importance and influence. 35 years ago the Subway Sect performed in Scotland on the White Riot tour, and to quote Davy Henderson, “things changed forever, baby”. The effect Sect principal Vic Godard has had on Scottish lit.pop has resonated ever since, as evidenced by his recording associations with Scottish independent labels Postcard and Creeping Bent. But first, let’s go back, way back to May 1977 when the White Riot tour rolled into Scotland. The teenage punk cognoscenti in the audience were so enamoured by the Subway Sect’s grey treble glare and literary aspirations, that the prime movers went on to form the labels (Fast Product and Postcard) and groups (Scars, Fire Engines, Josef K, Orange Juice) that became known as The Sound of Young Scotland. Every generation of Scottish independent pop group since has carried a torch for the Sect with lineage stretching from Orange Juice to the Pastels to Belle & Sebastian to Franz Ferdinand. Moving on to 1980 when Postcard’s Alan Horne bootlegged the Subway Sect’s performance in London at the Music Machine, he set in motion a chain that could be said to link Scottish independent pop music from 1980 to the present. 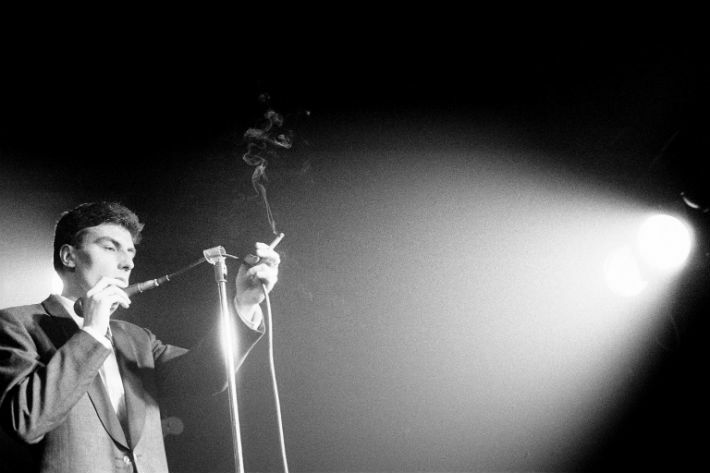 Postcard’s Orange Juice worked up a cover version of an unreleased Sect song from Horne’s bootleg, a northern soul influenced number called Holiday Hymn. Orange Juice recorded Holiday Hymn on their 1981 John Peel session for BBC Radio 1, and the rest is history. The Subway Sect’s influence on Postcard and beyond is indelible and every generation of Scottish independent pop group since has carried a torch for the Sect with lineage stretching from Orange Juice to the Pastels to Belle & Sebastian to Franz Ferdinand (and all roads in between). The Creeping Bent Organisation has worked with Vic Godard since 1998 when Vic appeared live with Adventures in Stereo at the Royal Festival Hall as part of an evening of Creeping Bent entertainment at John Peel’s Meltdown Festival. Vic has also worked with Creeping Bent artists such as The Leopards, The Secret Goldfish, The Nectarine No9 and continues to collaborate with the label. Douglas also penned the recent Run Run Run series on Racket Racket in which Subway Sect and the subsequent Glasgow post punk cognoscenti feature. It’s well worth a read.